Bath time is one of Riley's favorite times of the day, for she can retreat to her water wonderland and play with a whole new set of toys! Unfortunately for us, cleaning and storing her bath toys is not an easy job. There are so many little pieces which each need to be rinsed off everyday and put in an area so that they can dry sufficiently. Bath toys which aren't cleaned and allowed to dry, accumulate soap scum and even mold rather quickly and are then too nasty for your children to play with anymore. 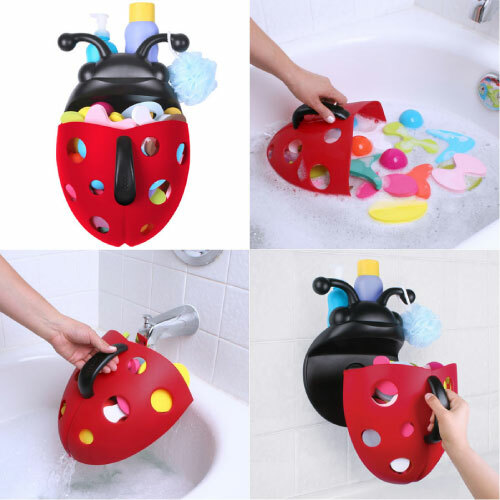 Thankfully, Boon, Inc. has invented a terrific item, called the Bug Pod, which organizes your child's bath products, helps to clean their toys as well as store them in an area where they can dry. The Bug Pod also looks super cute too! Keep reading to learn more! I reviewed the Bug Pod Bath Toy Scoop in Pink and the Splat Bath Toy from Boon, Inc., which retail for $34.99 and 7.99, respectively. Boon, Inc. automatically donates 10% of its profits to children's charities. I was fortunate enough to review two bath products from Boon, Inc., the Bug Pod and the Splat Bath Toy. 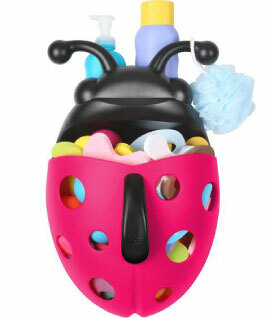 The Bug Pod Bath Toy Scoop is an all-in-one organizing solution for your child's bath products and toys. Installation couldn't be easier and Boon includes two options for securing the Bug Pod to your bathroom's tile wall: hardware and adhesive tape. Since I didn't want to permanently screw the mounting plate into our tile, I opted to use the adhesive tape. This couldn't have been easier to do, but you are advised to apply the mounting tape when the bathroom will be dry for at least 24 hours, so that the adhesive can adequately cure to the wall. I also noticed that Boon makes a mounting plate for the Bug Pod using only suction cups, but this plate is sold separately. Once the Bug Pod was secured to the wall, I put it to work! The small shelf behind the bug's antennae easily housed two bottles of bath products, so now Riley's all-in-one shampoo and bubble bath has a permanent home. I also liked how the bug's antennae could do double duty by holding a bath sponge or washcloth. Of course, the best feature was how quickly and easily I could now collect, wash and store Riley's bath toys. Simply detach the colored bug body from the mounting plate, scoop up your child's toys, rinse them out inside the scoop and reattach the container. Riley's toys were then clean and dry for her next bath! Riley squealed with delight when she saw the Bug Pod in Pink mounted to the bathroom wall. She loves bugs and as a matter of fact, her entire room is decorated with ladybugs, so this was a perfect bath accessory for her. The real bonus was that because the Boon Bug Pod looked so cute and like so much fun, Riley actually likes using it to clean up her own toys! Now that was a benefit I hadn't counted on! Finally, Riley had the chance to play with the Boon, Inc. Splat Bath Time Ring Toss Game. This game comes complete with a funky, blue floating base and three colored rings to try and toss onto the base's peg. The Splat Bath Toy is also BpA, Phthalate and PVC free and is safe for children ages 6 months and up. The great thing about this bath toy is that Michael and I had as much fun as Riley did playing with it. Now, you could have a ring toss challenge between parent and child during bath time. Don't let this game fool you either, it is definitely not easy to do! If you would like to enhance your child's bath time and at the same time, make clean-up quick and easy for yourself, then grab the Bug Bod and Splat Bath Toy from Boon, Inc. These bath time products are durable, well-designed and guaranteed to brighten up any bathroom. Disclosure: I received the Bug Pod Bath Toy Scoop in Pink and the Splat Bath Toy from Boon, Inc. in order to facilitate my review. No other compensation was received. This product review is based on my own personal experiences with this item and is completely honest and objective.